I can see how much better it would be as a rectangular quilt. Its current square format looks as if I just wanted to get it over with. Which is true. If I would just add two more rows, the quilt would be more pleasing to the eye. I can’t say why exactly but rectangles are nicer to look at, which is probably why standard photos are sized at 2 x 3, 5 x 7 and 8 x 10. Two more rows would be five more Dresden Plates and 45 more tiny Baby Windmills. That doesn’t sound so bad except that the windmill blocks didn’t come out to the size they should have, and now they are all wonky in the quilt. Do you see the wonky ones? It’s because I trimmed the blocks down which was a bad decision. I think I was tired and frustrated and just over the whole thing. How I wish I wouldn’t have done that but it’s too late now. If you look at the overall quilt again, I guess you could say that maybe they aren’t that noticeable in the grand scheme of things. But DANG. I wish those weren’t all wonky. Should I make two more rows for a quilt that is already seriously flawed? Would they be enough to salvage it? Or should I just finish it as a square and chalk it up to life lessons? My quilt helper (a.k.a. the dear man of the house) was in town this morning and managed to find more background fabric. I was hoping the local quilt shop would be out and then I wouldn’t have to make more rows. But alas, not the case. 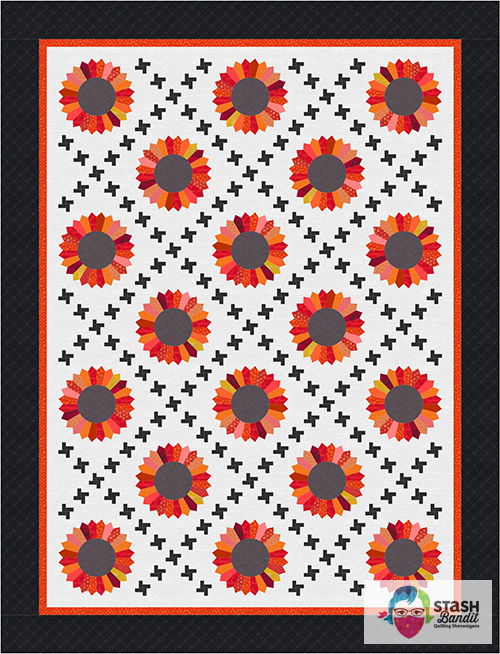 To make matters worse, I have a new border idea for the quilt that could have sent it over the top. Not quite what you see here but actually much better. Should I put that much work into a border for a quilt with wonky windmills? Maybe I can just call the quilt Wonky Windmills and pretend it was always meant to be?! 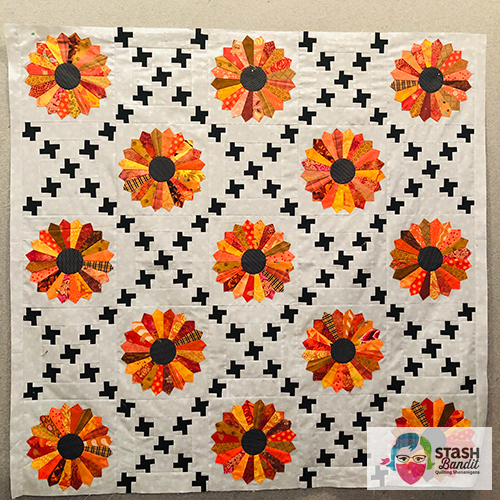 *This quilt will go into Windy Wonders and Let’s Play Drezzup, two of the seven programs I have available for quilt guilds. Give me a call and Let’s Talk Quilts! I like the wonky windmills. Before I read the explanation, I was wondering how you got such great movement from those simple little shapes. I also like it square with the multicolored border. Sometimes more is just more, not better. Diane…I really like the black, wonky windmills! I think that if you’re going to sell the pattern or put it into a book, you need to redo the quilt…no fun, true! If you redo the quilt, I would make the dresden blocks larger and the windmills a bit larger ( which would take care of the wonkiness) and only make 8 dresdens. 2 on the top row, 1 on the next and so on…I’d make the border out of double sided dresdens somehow, like a prarie point but longer. 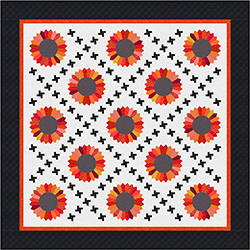 I would also make the border possibly in blacks with a sprinkling of oranges. I wish I was close by to help! I could help cut while you sewed…I just hate it when you have to redo something! I’d put a border on this one and use it as a baby quilt or a picnic quilt! It’s very pretty! 1. Get over the Wonky Windmills. They’re done. They’re already sewn in. Let it go. 2. If you were going with the black border, then I think the quilt needs to be rectangular. I really like the orange pieced border on the square version, however. 3. If you decide to go rectangular, make the extra Windmills just like you did the first batch, and wonk those babies up. Now it’s not a mistake – it’s a design element. 4. Point those Wonky Windmills out when you show the quilt. I find that trunk show audiences sometimes get positively giddy when I mention a point where I had to “punt” on a design. 1. If you’re going with the black border, I think the quilt needs to be rectangular. 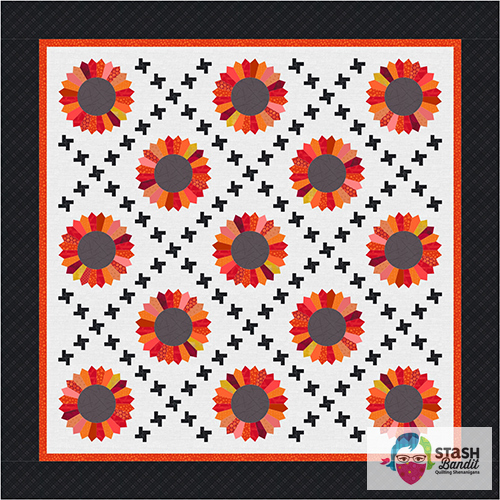 The pieced orange border looks great as a square quilt. 2. Embrace the Wonky Windmills. In fact, if you decide to make those last two rows, make the windmills just the way you did the first batch. Wonk those babies up. Now it’s a design element, not a mistake. 3. Be sure to point out the Wonky Windmills when you show the quilt. For some reason, trunk show audiences get positively giddy when I point out spots where I had to “punt” to get a design to come together. I agree with others — I like the wonky windmills. After all, they are “blown” every which way by the wind. Right? And who said you have to put a border on each side? Or matching borders on each side? Put a narrow black border on two sides and wide orange border on the other two sides. Or even a wide border at the bottom and a wider border at the top. How will the quilt be used? Is it made for a bed, or a lap quilt or to hang on the wall? Bed quilts should be the same shape (rectangle or square) as the bed top. Lap quilts and wall quilts can be either, but I prefer square for those. I like the square quilt with the piano key border. The wonky little windmills aren’t the main feature so they aren’t very noticeable. I would just finish it and move on to your next creation! Play up the wonky, it’s a force of nature. Love the orange piano keys. 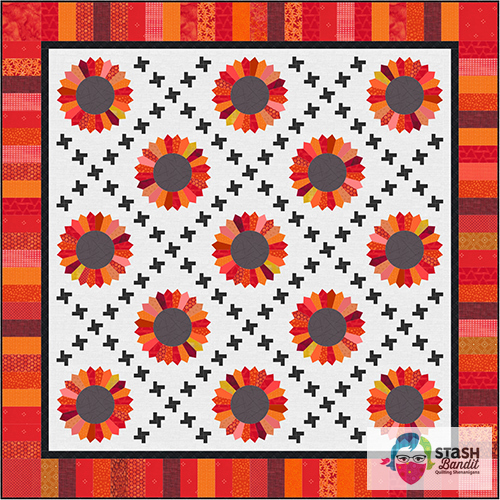 Since this is for a guild program, I would stick with the square option and the piano key border to keep it simple (plus I LOVE the wonky windmills), but you could give the participants the info for a large quilt if they want to do it. 1. Stand away from the quilt. Close your eyes and open them and see if you still see the wonky blocks. 2. 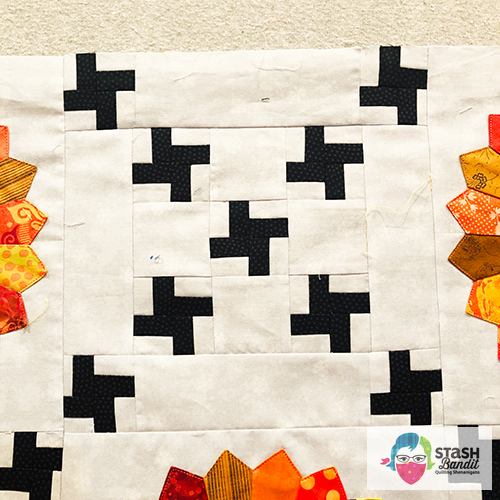 What would you tell me (or another quilter) about this if we wrote to you with this problem? Follow the advice you would give to us. I think there is a phrase finished is better than perfect. Right? Don’t they say ‘Done is better than perfect’? You can’t see the wonkiness, and even when pointed out it kind of looks like it was meant to be. If you’re really tired of it, just go square. If someone wants to do more, then they can. But I do love the new border idea. Maybe it’s a good compromise in leaving it square, but adding a bit of a punch to it! I am not bothered by your wonky windmills. I really didn’t notice them until you mentioned it. I don’t like a square quilt, but if it’s just for your trunk shows, it’s up to you. I do like the pieced border on it. I agree that “finished is better than perfect”. The wonkiness makes it HUMAN made, not factory made. It gives it character and life. Keep it, love it, embrace it. Like another asked, is it for the wall, or for a bed? If the wall, make it fit the wall. If it is for a bed, make it fit the bed. A lap quilt? then spill all you want cause you don’t love it right now. But it just may be the one the kids, or grandkids want just because of the wonkiness.